Seven summits reported by Kobler & Partners team from Gasherbrum II. Laura González del Castillo, Yuri Contreras Cedi, Sophie Lavaud, Ernst Felix and Christof Bartmann successfully climbed Gasherbrum II today, July 16th 2015. Moreover two sherpas of K&P also reached summit. Total number of summits reported today from the mountain is seven (5 members and two sherpas). Team is back in camp 3 now, Leader of expedition Peter reported from camp 3 that five members and two sherpas have climbed the mountain. As per reports Sophie Lavaud has not used supplemental Oxygen. 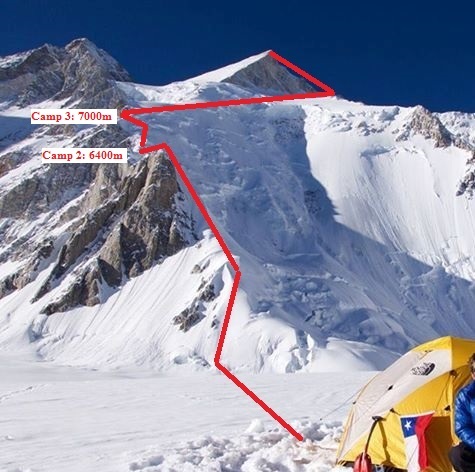 Gasherbrum II 8035 meters: Climbing route from Camp 1 to summit via banana ridge. Team left base camp at 2 a.m. to get to camp 1 on Monday, Camp 2 6400m on Tuesday 14th, Wednesday 15th on camp 3, sleep during the day and attack on Summit at 22.00 pm on Wednesday 15th with a forecast to reach the summit between 7 am and 9 am on Thursday 16th of July (Although they reached summit in afternoon due to terrible snow conditions).